The Montecristo OPEN Junior Tubos is a medium cigar, of Trabuco format, of 38 ring gauge, 4.3” (110mm) long and comes in a box of 15 aluminum tubes. Being part of the OPEN series, it is also a cigar that would suit any aficionado that enjoys smoking a stogie during an outdoor activity. Being the shortest and perhaps the mildest of this series, it also appeals to first time Cuban smokers; it is an easy way to discover the unique Cuban flavors. The Montecristo OPEN Junior is great for any outdoor sporting activity. 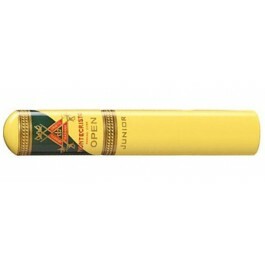 •	This is the fourth cigar from the new Montecristo-Open line. A small sized Montecristo with a second ring with the Golden letter OPEN and the vitola name. This cigar is a must have for any cigar aficionado who also happens to love golf. The Montecristo OPEN Junior has a smooth oily mottled wrapper and is very firm. The aromas are of light cocoa and earth. This cigar presents an even burn, and a nice easy draw. The first third starts out sweet with notes of chocolate and earth. Into the second third we get hints of bitter coffee, minerals and some brine with more chocolate and earth. This cigar finishes with leather and dark cocoa with lots of smoke. In summary, the Junior is gentle, never aggressive.